This 85-minute documentary can be found on the Shout Factory! 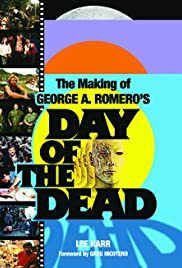 release of DAY OF THE DEAD and features interviews with George Romero, Tom Savini, Lori Cardille, Anthony Dileo, Jr., Sherman Howard, Joseph Pilato, Mark Tierno, John Harrison, Anthony DiLeo and many others who were involved in the production. There has been quite a bit of bonus material made for this film so this here really takes things to the next level and really gives fans a details look into the making of the film. Pretty much every aspect of the production is covered from Romero's original script, how the film got made and of course the budget that was cut due to the director not being able to deliver a R-rated film. Many of the stories from the previous documentary and commentary tracks are repeated here but there's some new material as well as a few new things from Romero. Romero talks about the original screenplay and says that it really wasn't that big of a deal that he had to cut it down. He really downplays the legendary or mythical "epic" scale of it. He also continues to say that DAY is his favorite of the series but then states that SURVIVAL OF THE DEAD is his second favorite and he mentions how he hopes that film eventually finds an audience like this one did. Obviously, if you're a fan of DAY OF THE DEAD then this here is a must see because there are just so many cast and crew members telling stories. Even better is that we're really given all sorts of details about the cast's reaction to fans and critics originally hating the film and then there's some nice talk about how the movie's popularity has grown over the years.